Create the ultimate glittery, shimmery multi-coloured temporary tattoos with this fun kit! Follow the detailed colour illustrated activity guide to learn the application techniques, then let your imagination fly! Join the glitter tattoo craze with this FabLab Glitter Tattoo kit! 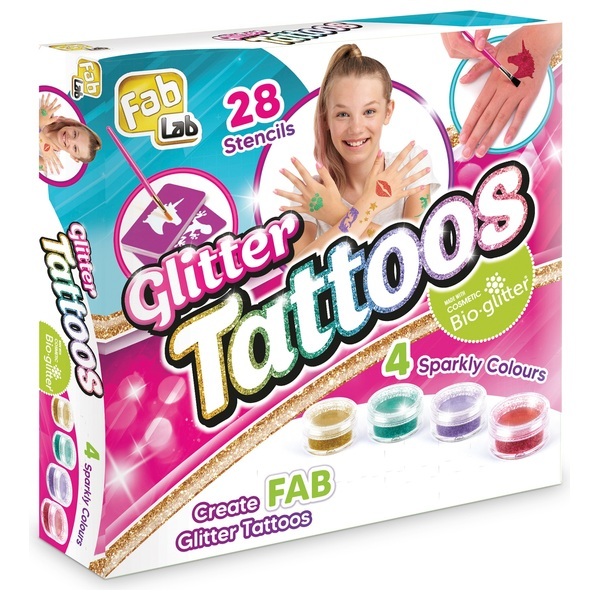 With over 28 unique eye-catching tattoo designs and 4 sparkly glitter colours to choose from you can create the ultimate glittery, shimmery, multi-coloured tattoos that can last up to 7 days! Follow the detailed activity guide to learn the application techniques, then be artistic and create tattoos in different colour combinations! Now with new trendy designs including Unicorn, Mermaid and Emoji! EU Warning: Not suitable for children under the age of 3 years due to small parts which could cause a choking hazard. Adult supervision is recommended. Read and follow instructions.